Awesomeness in a cast iron skillet | ___is black the new black? Not too long ago, I was pondering gift ideas. I make a very nice little recipe of Ina Garten’s, but it calls for cashews, which aren’t exactly cheap. 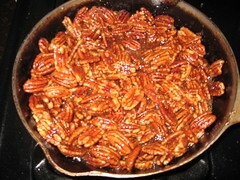 Then I found Alton Brown’s recipe for Spiced Pecans. You basically take a pound of pecan halves and toast them in a cast iron skillet for a few minutes. You then add butter, then a spice mixture, then brown sugar and some water. Presto, you have made crack. Okay, not crack, but really really really yummy nuts. After the first batch, I went a lot easier on the cayenne and cumin. Then I put the cooled pecans into 4oz Ball canning jars. So far they’ve been a hit. This entry was posted in cooking shows, recipes. Bookmark the permalink.